After the release of Read It Later's major update for iPhone (read my review if you missed it), the web interface went under a huge restyling too. 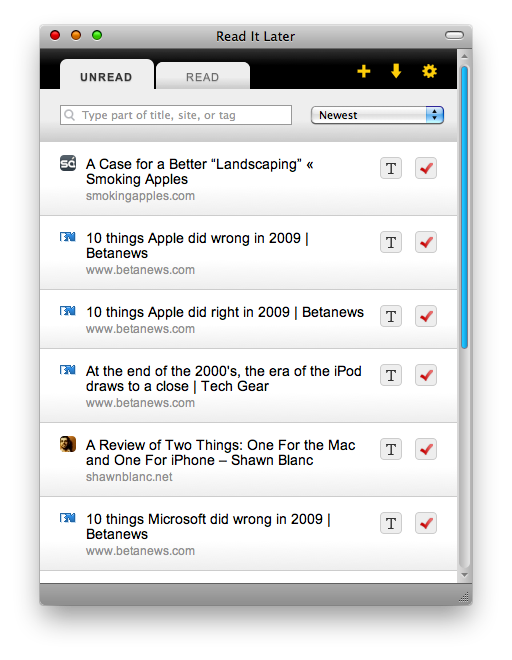 Now the RiL platform shares the same interface between the web reading list, the iPhone app and the famous Firefox addon. But what about the Mac? Is there an official Read It Later client for our desktops? The answer is no. But, there's this Josh Nichols guy, who put together a userscript called "Read It Later Restyled" that brings the awesomeness of the newest update to a Fluid app near you. Just create a SSB with Fluid, download the userscript and place it into yourname/Library/Application Support/Fluid/Read It Later/Userscripts. The result is gorgeous, and you can also download some custom icons from Josh Nichols' website. Can't wait to see what Instapaper Restyled creator will come up with.